The JABSOM Pathology Department is delighted to be the recipient of a Robert T. Wong Lectureship for 2018-19. Our invited lecturer, Dr. Marisa Saint Martin, is an Assistant Professor of Pathology at Loyola University, Maywood, IL, and is Associate Program Director for their Pathology Residency Program. She is a graduate of the Goal Imagery Institute-International Schools of Coaching Mastery as a Holistic Life, Career and Executive Coach, and is also an Associate Certified Coach of the International Coaching Federation. Dr. Saint Martin established a wellness curriculum with monthly talks for the pathology and other specialty residents. 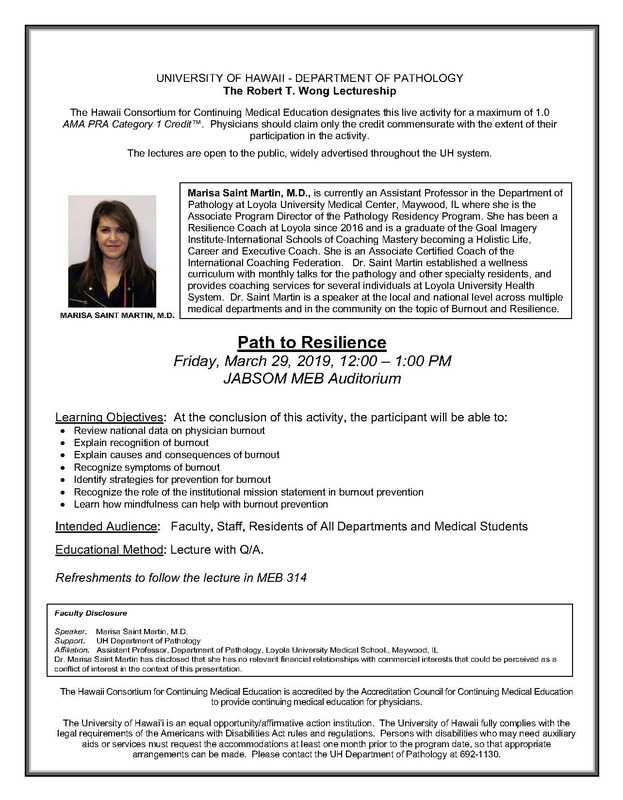 She will present two separate lectures on physician well-being, resiliency, and burnout in the healthcare environment for those of all specialties. All faculty, staff, residents and medical/graduate students are invited to attend. The lectures are open to the public, widely advertised throughout the UH system. Educational Method: Lecture with Q/A. One credit hour of CME will be available, and refreshments will be provided after each talk.